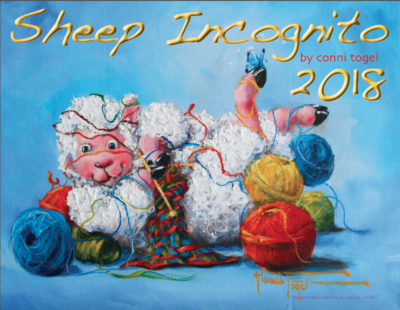 Sheep Incognito Art By Conni Togel | The New 2019 Sheep Incognito Wall Calendar Is Here! The New 2019 Sheep Incognito Wall Calendar Is Here! Snag ‘Em While Ewe Can – only 500 available! As every year since 2006 or so, we have created a new Sheep Incognito wall calendar for you – it has become a favorite in many offices, conference rooms, class rooms, and family homes. Mainly, because the cute Sheep Incognito will make ewe smile! This year – due to a very hectic time during the layout process – we overlooked the most prominent bit of text on the front page of the calendar: the year’s date. Everything else inside the calendar, such as months, year date, and holidays are correct – just that front page number was not noticed and changed on the front page. So Ewe will now own a bit of “Bloopery Art History”, when you snag one of these limited edition wall calendars. 13 months of Conni’s sheepish humor, some really strange, some really funny, some just happy, holidays during each month, so ewe will always have something to look forward to in each month. And, this being a limited edition calendar – we have cut the edition down from 1200 copies to only 500! If you would like your copy signed by the artist, Conni Tögel, please specify at checkout, or give us a call at the studio. And this year, we are offering sweet “Flock Discounts” on them as well – get your entire Christmaaaahs shopping done in one fell swoop – the more ya buy, the more ya save, kind of thing. We do love sending smiles to the world – so thank ewe for helping our efforts by letting the Sheep Incognito hang out wherever ewe happen to be hanging out! Custom Yarn Shop Logo Design!